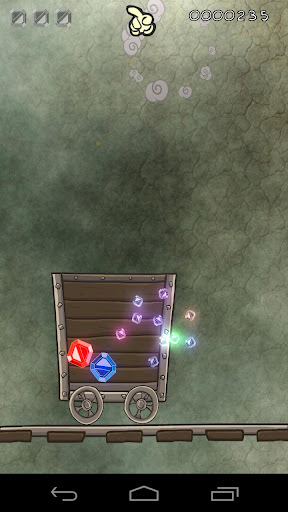 GemDrop Free and GemDrop DX by Sturdy Helmet Games are a pair of shiny new physics-based puzzle games for Android. The goal of GemDrop is to help Marty the Mole collect giant piles of precious jewels by capturing them in a minecart. As the gems fall into the cart they bounce around in a very realistic way thanks to the game's physics engine. 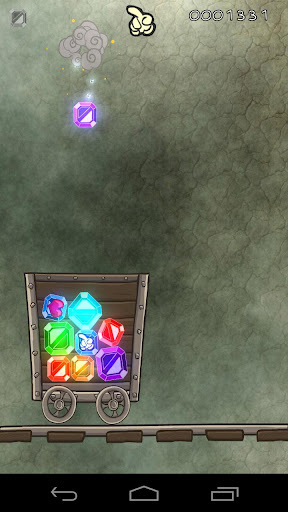 As the cart fills up with gems, inevitably gems of the same color come into contact with one another and the explosions that occur are brilliant to watch. The control scheme for the cart is incredibly well done and delightfully intuitive. Players can either tilt their device left and right to move the cart, or they can simply tap and drag the cart to the desired position. This comes in handy as the gems start to fall ever faster and players have to franticly do whatever they can to keep the jewels in the cart. Both GemDrop Free and GemDrop DX feature a host of power ups and two challenging game modes. The game's crisp grapics and smooth frame rates thanks to LibGDX. We're also incredibly excited to mention that the game's 16 unique acheivements and global leaderboards are powered by Swarm, the Android game developer's swiss army knife. So what are you waiting for? Get out there and download GemDrop. Start collecting beautiful jewels and make Marty the Mole's day! Give the game a try by starting with GemDrop Free, and then show Sturdy Helmet Games some love and buy the full GemDrop DX.